I'm just going to tell you right now - these pancakes are not light and fluffy! But they are healthyish and they do taste yummy. The oatmeal gives them a lot of texture and good-for-you fiber. I started making them for something that was a little fun and different for breakfast, yet I didn't want to jump too far off the mindful eating track. The raisins and cinnamon make them taste good enough for a holiday breakfast. But the banana is key; honestly without it this dish is pretty dry! In a large mixing bowl, whisk the eggs until the yolk and white are well combined. Add the mashed banana, oatmeal, buckwheat, milk, baking powder maple syrup, lemon juice, salt and cinnamon. 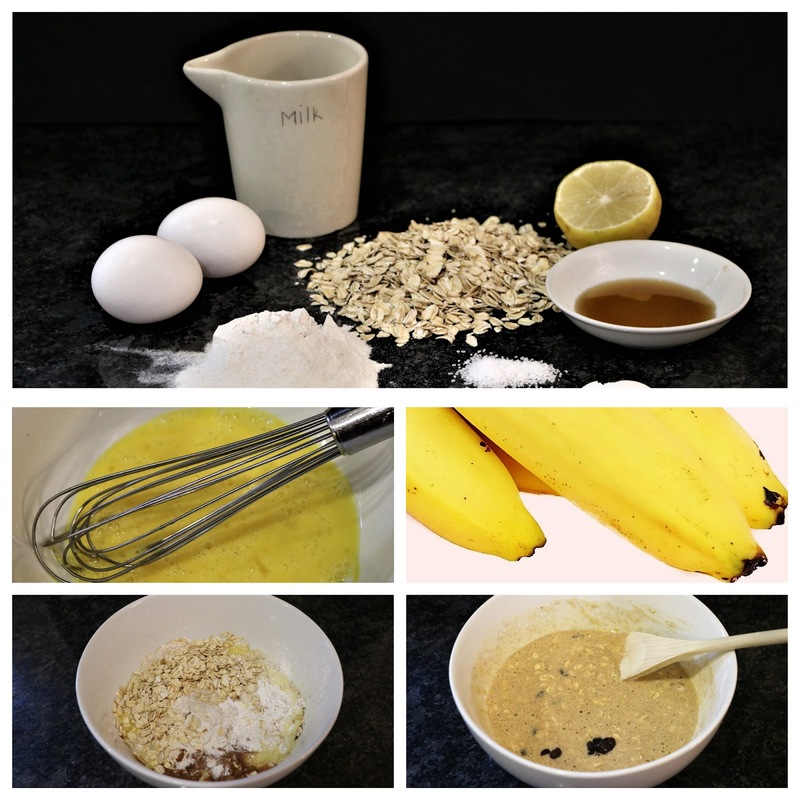 Mix well to incorporate all the ingredients into a blended batter. Stir in raisins. Heat the oil in skillet over medium heat until it shimmers. 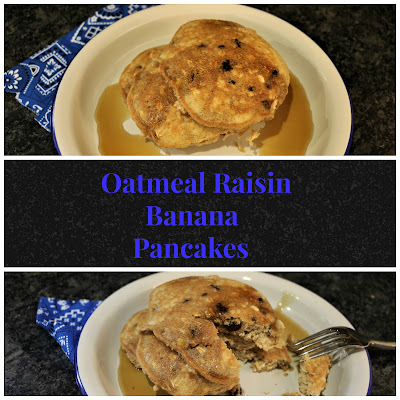 Working in two batches, fry three pancakes at a time by dropping 1/4 cup of batter on skillet for each pancake. When multiple bubbles appear on surface, flip each pancake over and cook for three additional minutes. 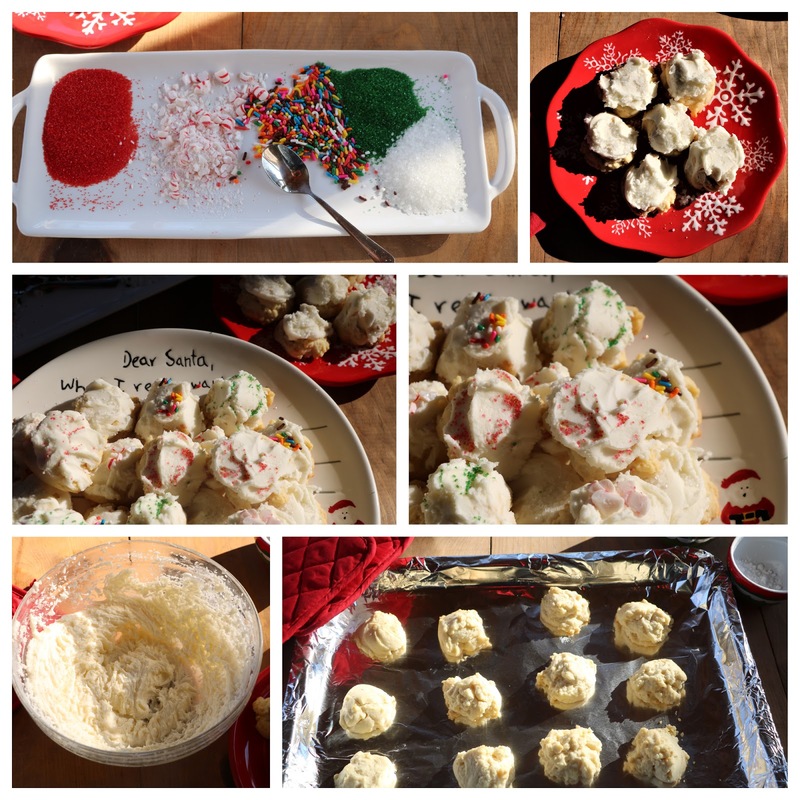 Old Fashioned Christmas Cookies: Easy and Super Delicious! The recipe for these cookies must be at least 100 years old. I'm guessing this because my grandmother, who was born in 1903, brought Christmas tins of these to our house every holiday season. I remember biting into them - still cold from being in the truck of the car - and literally sinking my teeth into the soft shortbread covered with frosting. Sometimes she decorated them with tiny edible silver balls which seemed to add a magical quality to them. 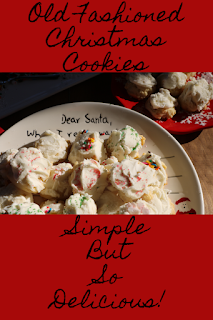 When I was about ten, she gave me the recipe and called them "Aunt Mary's Cookies". I should have asked her who Aunt Mary was! She must have been a relative that was gone before my time. I still love this recipe and even though they don't look very Pinterest or Instagram worthy, they are absolutely delicious! They are especially easy for kids to make which makes them perfect for the season. Merry Christmas! 1. and 2. 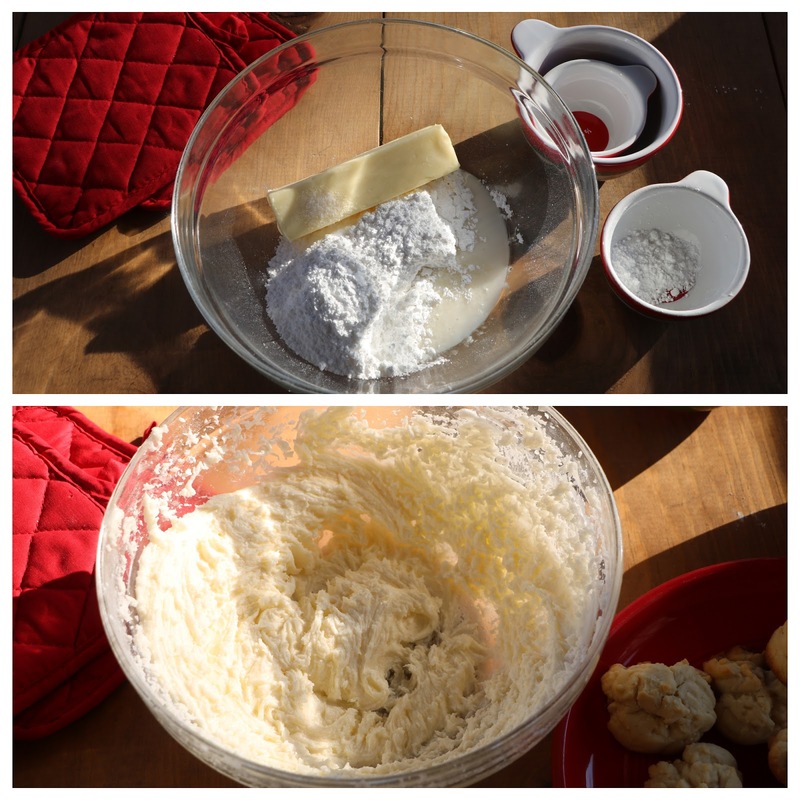 Using a mixer, cream the confectioners sugar and butter together until the mixture is light and fluffy. 5. and 6. Add flour, soda and cream of tarter (or baking powder) and either stir in or use mixer until the dough is stiff and smooth. 7, Use two spoons to drop rounded mounds onto an ungreased baking sheet lined with either foil or parchment paper and place in preheated 375 Fahrenheit degree oven for 12 to 15 minutes. Cookies will be done when they are faintly brown in places around edges or on top. Using a mixture, cream all ingredients together until light and fluffy. Frost each cookie and decorate with anything you wish! When we went to Australia a couple of years ago, I'm sorry to say this exhibit in the Melbourne Museum is as close as we got to seeing a kangaroo and an emu. 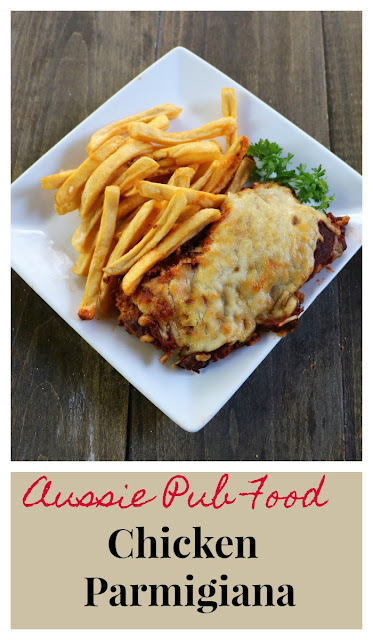 One thing we made sure to do was pop in to one of the pubs by the beach and get a parma - also called a parmy depending where you are in Australia. This dish would be called Chicken Parmesan in the United States, but its Aussie full name is Chicken Parmigiana and it's usually served with french fries, either underneath or on the side. Sometimes there is the option of ordering it with a ham slice under the melted cheese. It was amazing to me that a dish that would be served in a fine Italian restaurant here, was considered bar food there! I've made this dish for many years, sometimes substituting eggplant or even round steak for the chicken, and the girls always loved it. If you make it, send me a line or two and tell me how it went: yatesyummies@gmail.com. One of the reasons this dish is yummy is that the sauce is nice and rich! So the first thing you want to do is make this quick, easy sauce and let it simmer on low heat while you are preparing the chicken. Mix ingredients together in a sauce pan. Let the mixture simmer over medium/low heat for 20 or 30 minutes. Rinse the chicken breasts and pat them dry with paper towels. Set aside. In a bowl mix together the flour, salt and pepper. In a second bowl whisk together the egg and the milk or water. In a third bowl mix the bread crumbs, Parmesan cheese and dried oregano. Using tongs, take a chicken breast and dredge it in the flour. Then coat it in the egg mixture and finally cover it with the bread crumb mixture. Put enough of the oil into a skillet so it covers the pan and is about a 1/4 inch deep. Heat the oil over medium heat. Brown both sides of the chicken breasts about 5 minutes per side. Be careful not to let the pan get too hot because you want the chicken to be golden brown and not burnt. Transfer the browned chicken to a plate and drain the oil out of the skillet. Return chicken back to an oven safe skillet or place it in a baking dish. 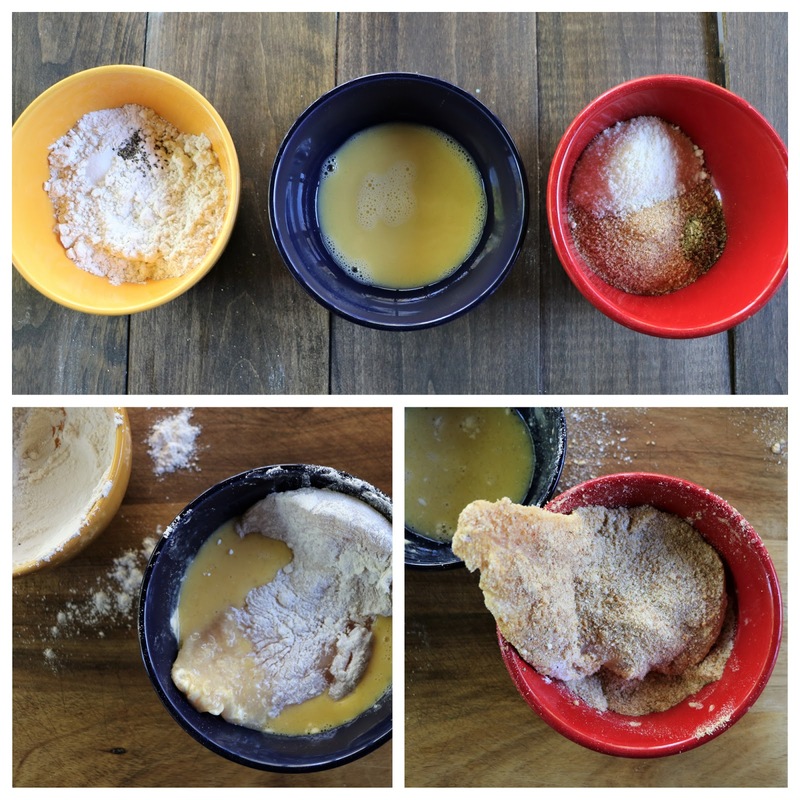 Spoon the simmered Parm Sauce over each breast and place in the preheated oven for 40 minutes. Carefully take hot skillet or baking dish out of the oven. Top each breast with 1/2 cup shredded mozzarella cheese. Return to the oven and continue baking for 10 additional minutes or until cheese is browning and bubbly. 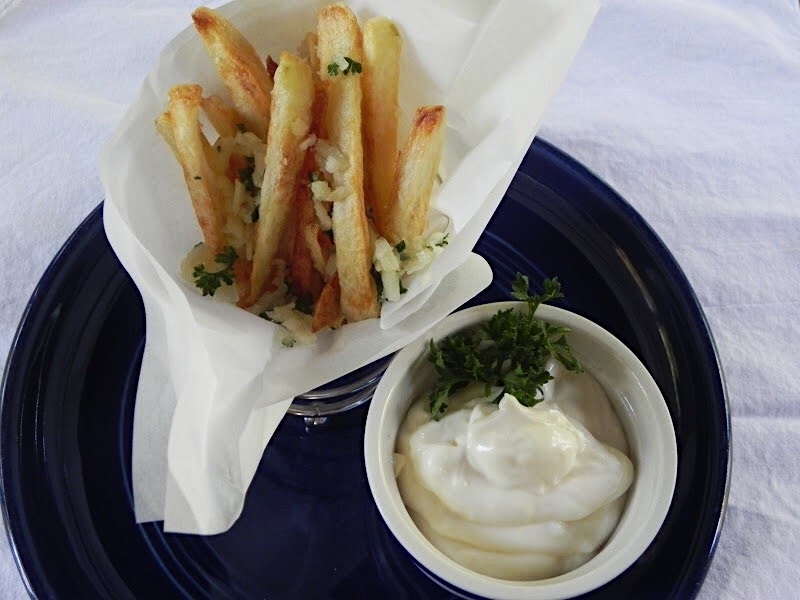 Serve with french fries as they do in the pubs or opt for a nice green salad! We've been traveling in our motor home for a couple weeks now. We went up through Michigan and crossed over into Canada. Then we traveled across the entire expanse of lower Ontario, went into Quebec and entered the Unites States again via New York. Upstate New York is a lot like upper Michigan; the 45th Parallel runs through both states - except New York has mountains! In both Michigan and New York we were gifted cucumbers and I found myself trying to do something other than just slicing into a lettuce salad. 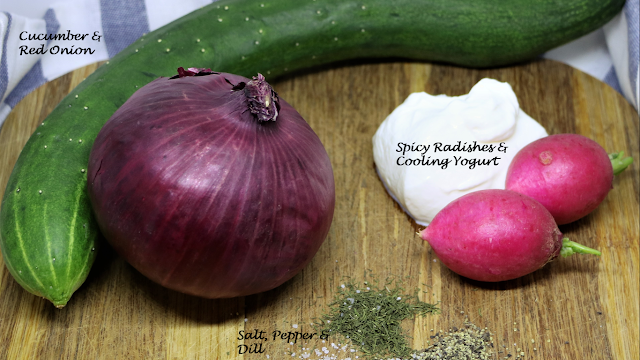 Pairing the cucumber with radishes gave them a kick and the yogurt kept it refreshing. But what I really liked was the flavor the thin red onion slices gave the salad; the yogurt mellowed them out and it made this quick and easy side really yummy! Wash and cut the ends off the cucumber. Thinly slice and put into bowl. 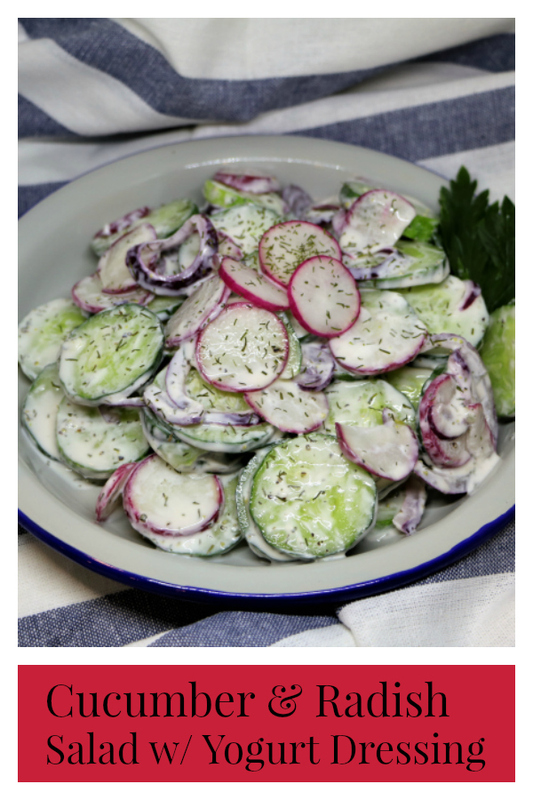 Wash and thinly slice radishes and add to cucumber. Peel onion, thinly slice and place in the bowl. Spoon in the yogurt and the salt, dill and pepper. Gently toss and refrigerate, covered, until ready to serve. Almost right after she graduated from Indiana University, Allison took off for Spain to teach English and explore the world. She got a week off at Easter time, and we joined her in Madrid. We rented a car and drove into Portugal. Back in the 1400s, it was a world power and its only rival was Spain. In fact, the 1494 Treaty of Tordesillas divided the world in half between the two countries. Nothing last forever - right? However, while Ronald Reagan was president, Argentina claimed that the treaty gave them the right to the British owned Falkland/Malvinas Islands. Of course England didn't agree and forcefully let it be known the treaty was obsolete! 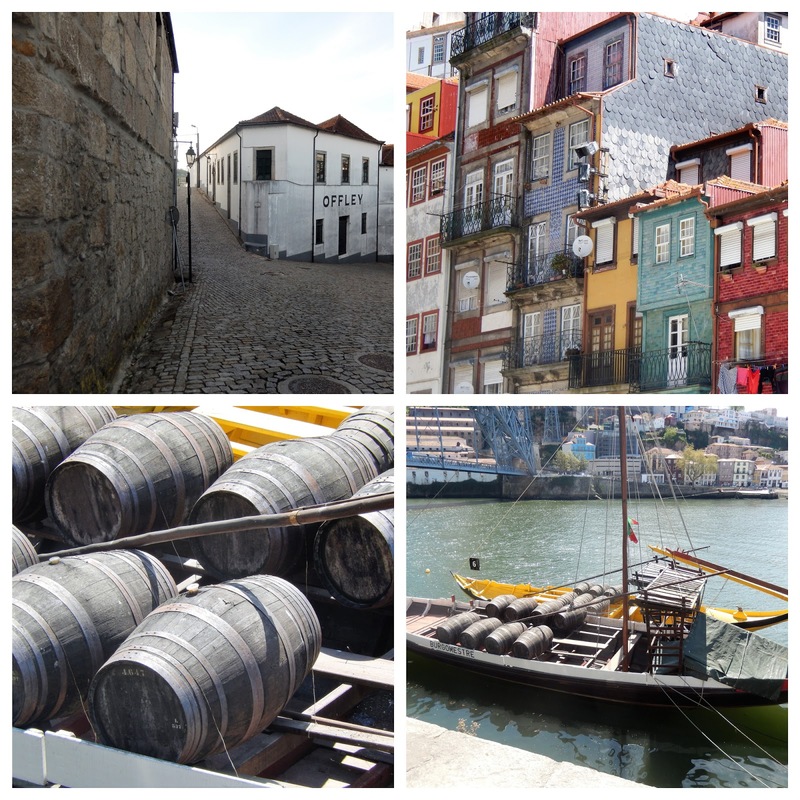 We stayed in the city of beautiful Porto for a couple days and were charmed by the tiles, the architecture, all the colors but especially by the food. On Easter Sunday we ate at a fabulous restaurant right on the water where Roy ordered a Francesinha, a sort of sandwich made of several pork meats which were swimming in the most delicious sauce any of us had ever tasted. It was definitely something cooked low and slow and had a dash of what Porto is famous for - port wine. When we got home, I was dreaming of those flavors but didn't have the time or patience to watch over something for hours. I don't drink alcohol, but I like to cook with it for the complexity it gives to a dish and I figured a bit of port might give me the essence of what I was looking for in a hurry. 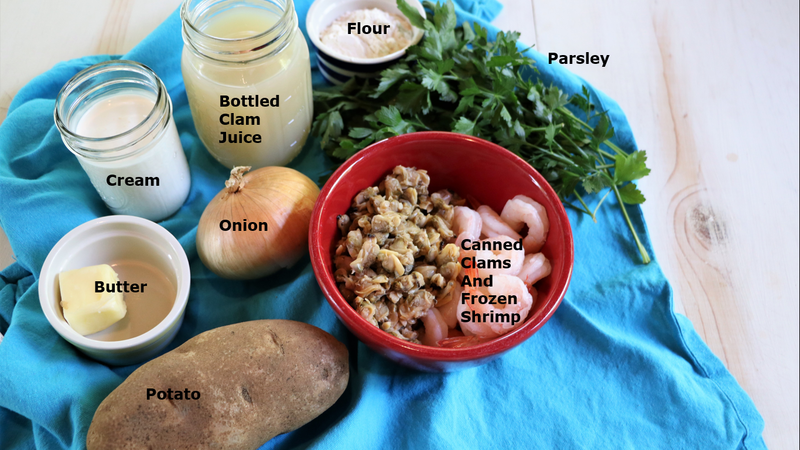 The inspiration for this dish posted here came from a recipe in the 2009 cookbook, The Family Chef by Jewels and Jill Elmore. I tweaked it a bit and the result turned out to be a favorite of Roy's. Of course, it is still totally delicious without the port and over the years I have often left it out. Peel each sweet potato and pierce with a fork. Microwave on high for six minutes. When cool enough, cut into cubes. Set aside. Combine 2 tablespoons olive oil, garlic, sage, thyme, salt, lemon juice and pepper to make a paste. Reserve 1 teaspoon of mixture. Rub the rest into both sides on each pork chop. Add the remaining 2 tablespoons olive oil in a oven proof pan such as an iron skillet or Dutch oven and place over medium high heat until very hot. Brown each pork chop about 3 minutes on each side. Remove from pan and set aside. Add the sweet potato cubes, diced red onion, 1/4 cup parsley and the reserved 1 teaspoon of spice mixture to the same hot skillet that the pork chops were browned in. Gently stir to combine and loosen the crispy bits. Sear the sweet potatoes, turning over once after 2 minutes. Continue to cook for 2 additional minutes. 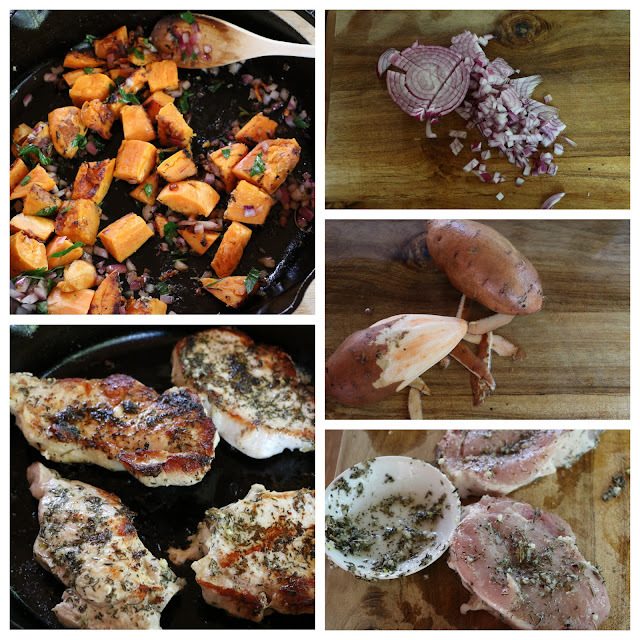 Return the pork chops to the pan, nestling them among the sweet potato cubes. 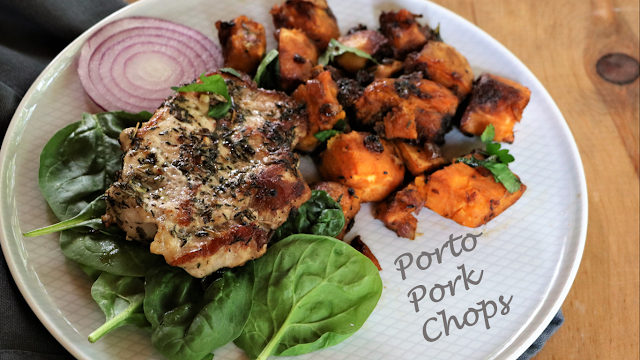 Pour the port over the pork chops and sweet potatoes and cook for 2 minutes. Place skillet into the oven and bake for 10 minutes. Remove from oven and sprinkle with 1 tablespoon chopped parsley. 1. It's considered to be a traditional Peruvian dish but it has a strong Chinese influence. 2. It's served, not with french fries but poured over them! 3. It's got french fries in it but is still fairly healthy if the fries are baked. 4. It's decadent, but it doesn't make me feel guilty! In the late 1800's and early 1900's, Peru experienced a wave of immigration from the area around the city of Guangzhou, China. These people brought soy sauce and woks; then they incorporated their cooking practices with ingredients native to their new home. This way of cooking came to be known as "chifa" and today is a common type of Peru cuisine. Roy and I had this yummy "stir fry" several times this winter when we were in southwest Florida where Peruvian food is very popular. I was surprised to find out that it had soy sauce in it because it had such spicy Latin flavors. 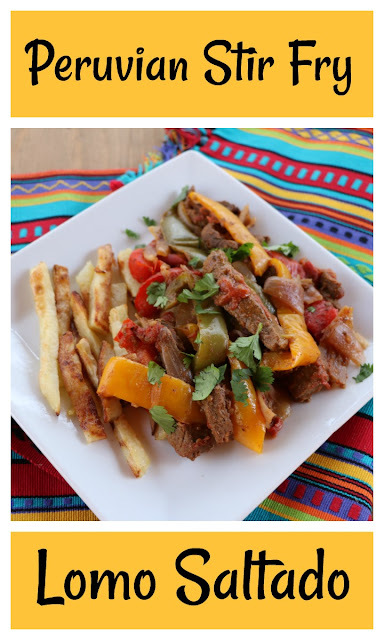 Authentic Lomo Saltado gets its kick from the yellow aji amarillo pepper, which I found as a bottled paste on Amazon. A good substitute is jalapeno or Thai chilies. "Lomo" translates to loin and this recipe can be made from beef tenderloin or, as I used, sirloin steak. Another cheat is using frozen french fries instead of making your own. So one more contradiction - it's festive enough for a weekend but easy enough for a week day meal. Trim all the fat from the steak, and slice it into thin strips. Combine the soy sauce, red wine vinegar, garlic, and 1 tablespoon of oil in a bowl. Whisk well, add the meat and gently combine. Set aside. Start making the french fries. Either follow the package directions for baking the frozen french fries or follow the steps below. Preheat the oven to 475 degrees. 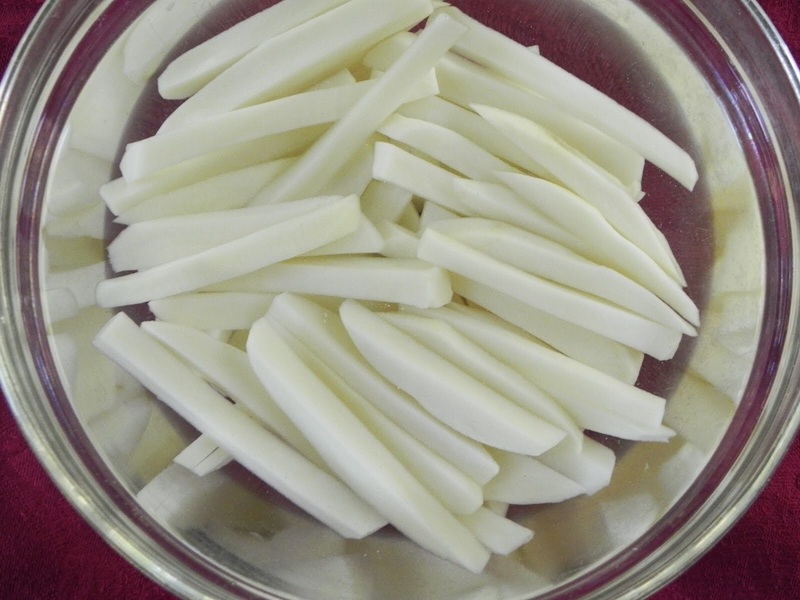 Peel the potatoes and cut them into 1/4 inch wide strips by slicing them lengthwise every 1/4 inch and then cutting those pieces into 1/4 inch wide strips. Rinse the strips and drain them. Then put them in a bowl and cover them with hot water. Let them sit for 10 minutes. Drain them, rinse them again, then pat them dry with paper towels. 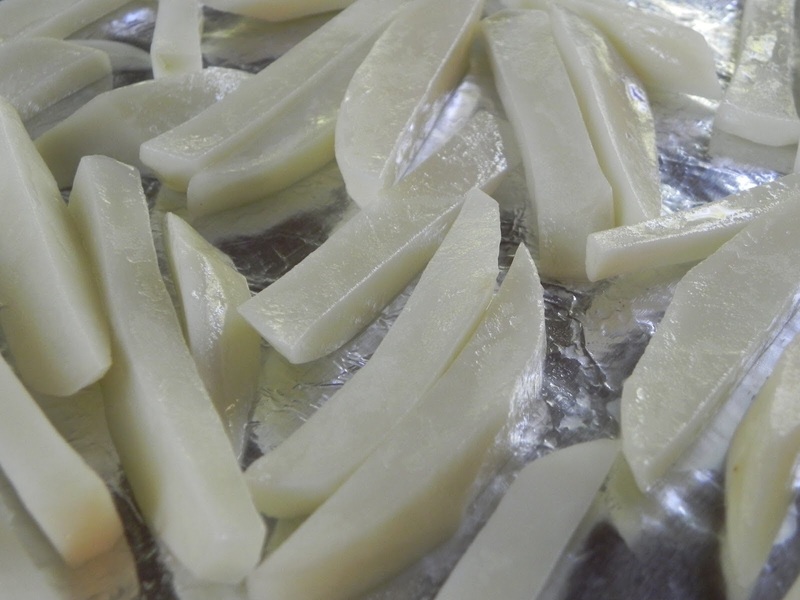 Spread the potato strips out on a baking sheet covered with parchment paper (best option!) or foil. Toss them with 1 tablespoon olive oil, 1/4 teaspoon salt and 1/4 teaspoon pepper. Spread them out again so they are in a single layer. Bake for 30 minutes, gently flipping over every 10 minutes, until nicely browned. But wait - we are using these fries for Lomo Saltado! 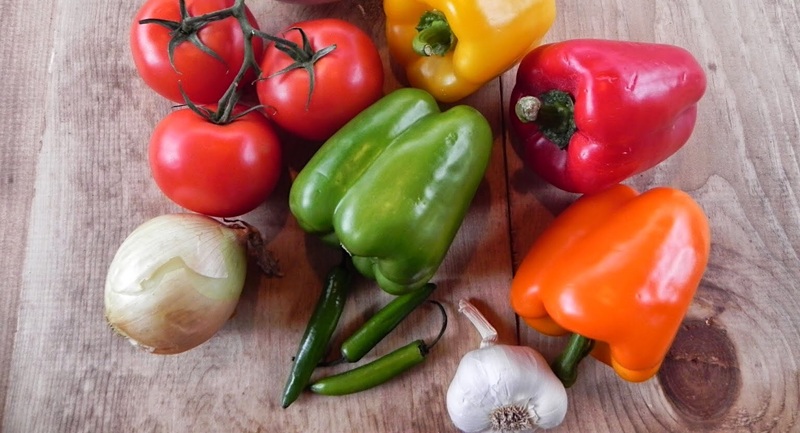 While the french fries are cooking, place the sliced bell peppers, hot peppers, onions, and 1 tablespoon olive oil in skillet. Saute over medium low heat, about 10 minutes or until tender. Add the tomato slices and saute until softened about 3 to 4 more minutes. 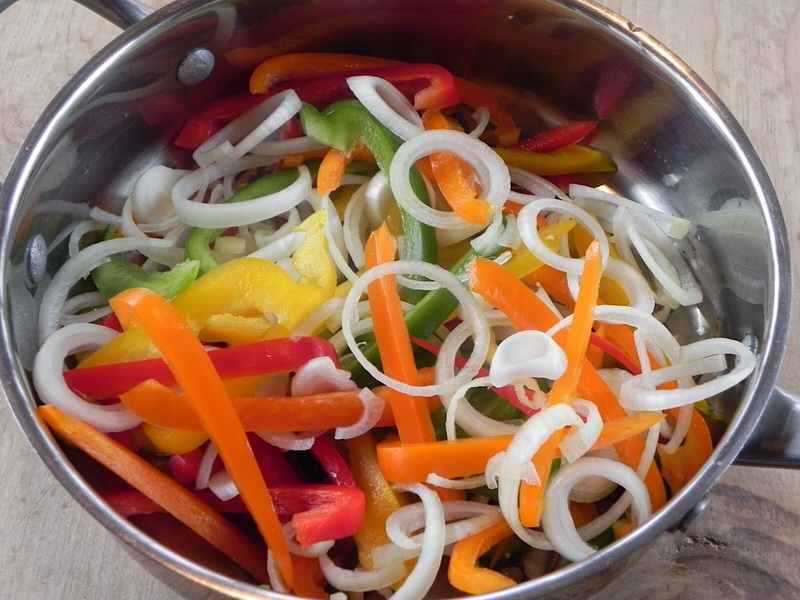 Remove the cooked vegetables from pan and set aside, covered. Place the meat mixture into the same pan. Saute until the beef is brown on both sides. Add the vegetables and gently toss. To serve, divide french fries among 4 plates. Ladle the Lomo Saltado on top. To garnish sprinkle a bit of chopped cilantro on top of each serving. We are back home from spending the winter in sunny southern Florida. It was getting so, so hot down there and I was complaining that I wished the temperatures were cooler. What was I thinking?! I woke up this morning to snow showers and 31 F degrees. I know that when it does get to be spring here, it will probably roar right into summer. Meanwhile, this salmon dish reminds me of the South American restaurants I loved to go to in Florida. Lots of eateries were blends of the best of different countries like Argentina and Peru. 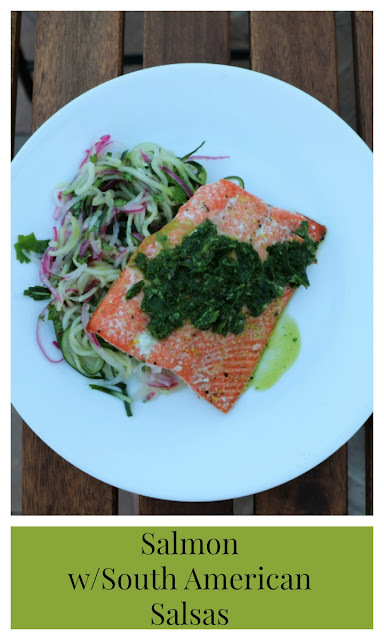 The green Chimichurri Sauce is usually served with an Argentine steak but I found out it goes great with salmon. I left out the diced red bell peppers, so feel free to include them to be totally authentic. Likewise, I riffed on the traditional red onion relish Criolla Salsa by adding spiralized cucumbers. The cucumbers could be cut very thinly as well instead of being "zoodled". Enjoy and think warm thoughts! Make the Cucumber "Criolla Salsa" by spiralizing the red onion or thinly slicing it. Place the onion slices in a bowl of ice water for at least five minutes so they won't taste bitter. Meanwhile, spiralize or julienne cut the cucumber and place it in a bowl with lime juice , 1/4 cup chopped cilantro leaves, 1/4 teaspoon kosher salt and 1/4 teaspoon red pepper flakes. After their "soak", drain the red onions, pat them dry with a paper towel. Hold back enough red onions to make 2 tablespoons diced (for chimichurri sauce) and add the remainder of them to the bowl. Gently toss and set aside. Make the chimichurri sauce by placing in a blender or food processor: 1/2 cup cilantro leaves, 1/2 cup parsley leaves, 1/4 teaspoon kosher salt, 1/4 teaspoon red pepper flakes, 2 finely minced garlic cloves, 1/4 cup olive oil, 2 tablespoons red wine vinegar and the 2 tablespoons diced red onion that was set aside. Pulse of process until the mixture is combined but still retains a somewhat coarse look. Set aside until serving time. Pan fry the salmon by placing 2 tablespoons of oil in a skillet. Heat to medium high and place the fillets skin side down in the pan. Sprinkle the seasoning salt evenly over the 4 fillets. Cook for 5 minutes. Juices should be oozing up to the top surface of the fillets. Flip over to finish them off, cooking them another 4 minutes. 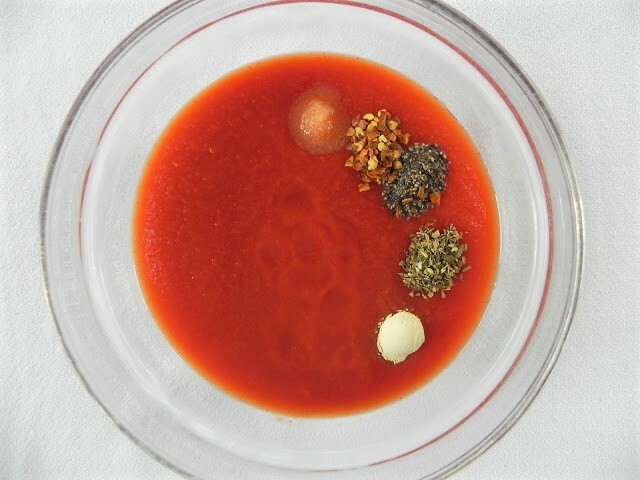 To serve, divide the Cucumber "Criolla" between four serving plates. Place a salmon fillet, skin side down, on each plate and spoon the Chimichurri Sauce over each one. This winter, Roy and I have been staying in one of the nicest RV "resorts" we have ever been in. The grounds are gorgeous and the sites are paved, spacious, and landscaped. It like going going to camp - there are so many activities that it's impossible to do everything that is offered. One pastime that everyone seems to partake in is eating! There are lots of pitch ins and opportunities for group dinners. 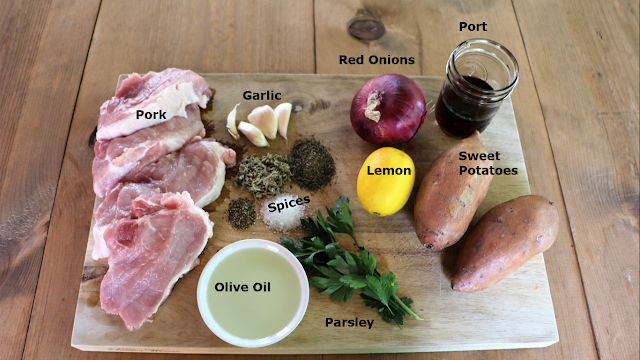 This recipe was born out of the need to bring a dish to contribute to a gathering, and wanting to offer something different. It's a great side to serve with grilled meat and for someone who avoids legumes, it is a good substitute for baked beans. Wash, peel, and cube the potatoes. Fill a large soup pan about half way up with water and bring to a boil. Add the potatoes and let the water return to a boil. Cook for about 5 more minutes or until the cubes can be easily pierced with a fork but still feel fairly firm. Don't let them get mushy. Drain and allow to cool. I actually put them in the refrigerator for about a half hour. While the potatoes are cooking, wash the radishes. Slice a couple and dice the other two. 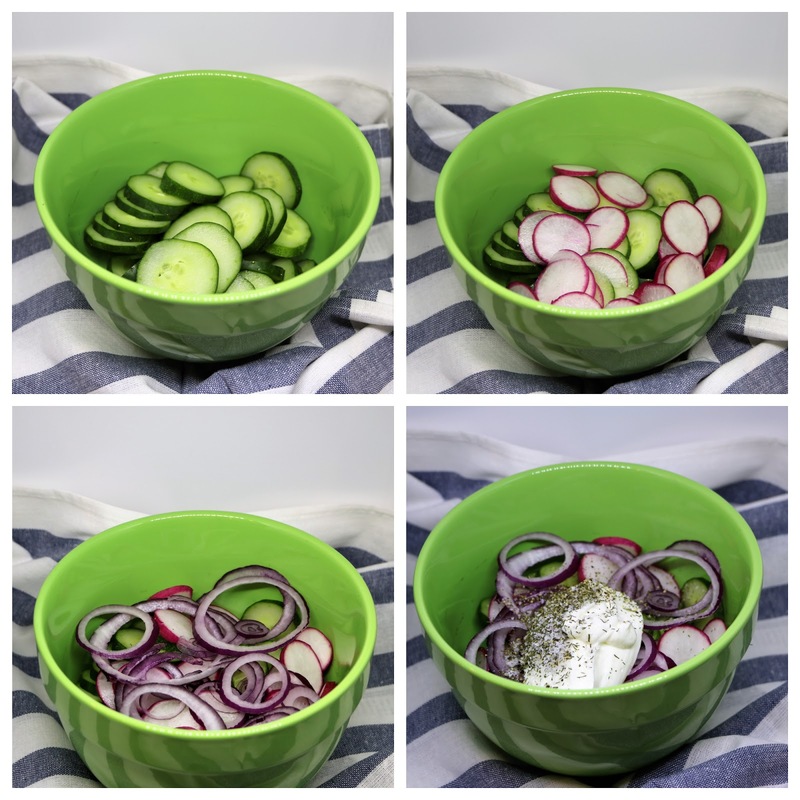 Set some of the sliced radishes aside for garnishing. If you haven't already done so, slice the green onion, and dice the red onion and jalapeno pepper. When the potatoes have cooled, whisk together the mayonnaise, apple cider vinegar, smoked paprika, cumin, salt, garlic powder, black pepper, and chili powder. 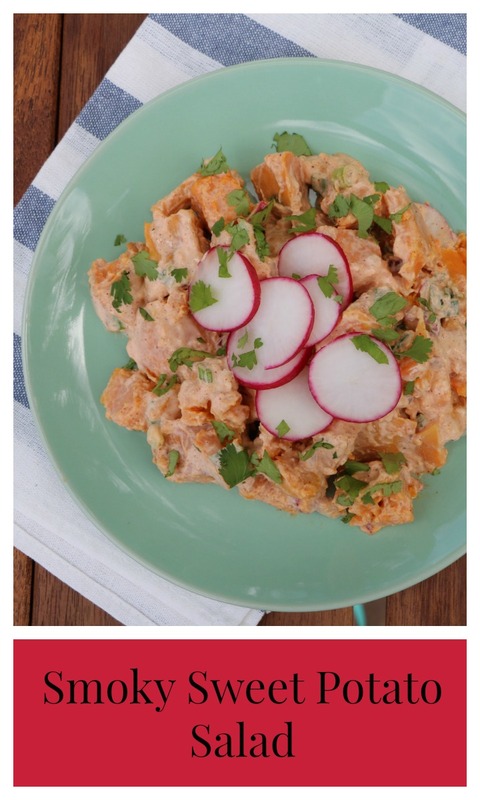 Place the cooled sweet potatoes, radishes, red onion, green onions and jalapeno pepper in a large bowl. Gently mix in the dressing.